Select a tab below to browse a wide range of ergonomic applications and system installations. 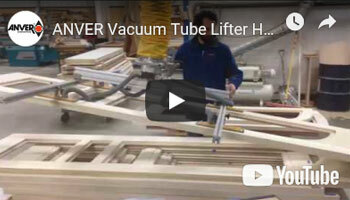 ANVER offers numerous configurations of tube sizes, pad attachments, and control handles for a wide variety of applications to handle panels and sheets. Click on any of the images below to review the vacuum tube lifting system specifications. ANVER offers numerous configurations of tube sizes, pad attachments, and control handles for a wide variety of applications to handle coils and rolls. Click on any of the images below to review the vacuum tube lifting system specifications. 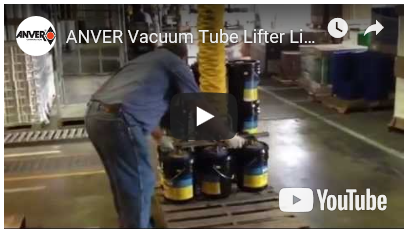 ANVER VT-Series Tube Lifters for plastic and paper bags and non-woven sacks feature a vacuum pad attachment with foam seal rings for a secure grip and allows one person handle loads up to 125 lbs. (57 kg) safely and rapidly. Providing a 100% duty cycle, with instant attach and release, these lifters swivel 360º under vacuum and are designed for production applications. In addition, ANVER offers a free testing service in our ergonomics lab to assist you in determining your load’s porosity and to help you in choosing the appropriate vacuum lifting system. System capacities are dependent on several factors (load surface porosity, load density, vacuum station, pad attachment, etc.). 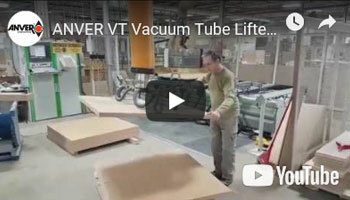 We offer many combinations of VT Vacuum Tube Lifting systems within each model range. Contact your local ANVER dealer for a free evaluation and recommendation of a system combination that will most economically and safely satisfy your material handling requirements. ANVER offers numerous configurations of tube sizes, pad attachments, and control handles for a wide variety of applications to handle corrugated cardboard and cartons. Click on any of the images below to review the vacuum tube lifting system specifications. ANVER offers numerous configurations of tube sizes, pad attachments, and control handles for a wide variety of applications and various material. Click on any of the images below to review the vacuum tube lifting system specifications.